I believe that a litigator who appreciates the many approaches to dispute resolution and the many ways in which firms have sought to resolve disputes is a problem solver who draws from a large toolkit to get results that meet a client’s needs. Find out what makes my Law Services different. Read about my experience in the field of law. Find out more about my litigation services. Find out more about my consulting services. View some FAQs I often get related to law. 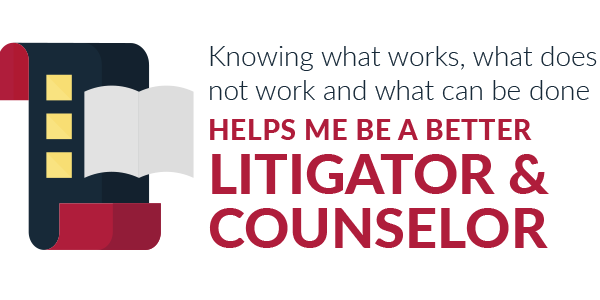 Knowing what works, what does not work, and what can be done helps me be a better litigator and counselor. Interested in ADR or Law Services? © HirshADR PLLC 2019 | © Law Office of Merril Hirsh PLLC 2019. All Rights Reserved.